Just in time for school! Stop by the Annual FOAL Book Sale on August 19 during the library regular hours (10am-5pm) and stock up. FOAL Members attend the preview night, Friday, August 18 from 5-7pm, and you can get the pick of the selections! You are invited to the Friends of the Atascocita Library Annual Meeting, on Tuesday, May 9, at 4:00PM in the children’s area of the Atascocita Library. There will be a very short business meeting to elect officers and present the 2017-2018 budget for next year. The program will celebrate the dedicated FOAL volunteers, including those participating in corporate volunteer involvement grant programs. Best Buy Atascocita: Deante Knighten, Employee Experience Team Co-Captain; Sierra Baumbach, Employee Experience Team; Claudia Washington, Community Events Coordinator & Employee Experience Team Captain; & Jessica Espino, Employee Experience Team; Dawn Mehan, Atascocita Branch Children’s Librarian; Becky Berry, President, Friends of the Atascocita Library. “Robotics and Coding” at the Atascocita Library was chosen from a select group of national certified 501(c)3 nonprofit organizations and tax exempt public charities that help teens improve technology skills and inspire future education and career choices. 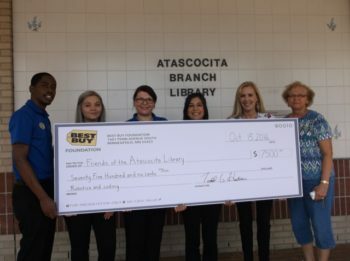 The Friends of the Atascocita Library received a $7,500 Grant for the Lego Robotics Programs which encourages young children and tweens to learn, experiment, collaborate and play with technology so that they will become excited about learning and developing skills and experiences to help them succeed academically for future careers. (Technologies include: computing, digital photography, filmmaking and videography, graphic design, audio production, robotics, game development and programming, including app development). The grant is awarded to organizations with a demonstrated track record for building skill proficiency in technology through out-of-school time programs. Over the years, FOAL volunteers who work for companies that fund grants for hours volunteered have done so for the library. Recently, Allstate Agent Timothy Bates volunteered his time at the library in order to fulfill application requirements for A Helping Hands in the Community grant. This grant not only requires the Agent to volunteer time, but is limited in number and rewarded after review. We appreciate Allstate Foundation’s support of FOAL as we continue our mission to benefit the library and the community. Other companies in the area, including ExxonMobil, Chevron, and Best Buy, support their employees or retirees volunteerism by providing grants. Check with your Human Resources department to see if they do the same. Kroger Community Rewards: Time to Re-Enroll! Last year FOAL received over $900 to benefit the Atascocita Branch Library. INSTRUCTIONS FOR KROGER COMMUNITY REWARDS SUPPORTERS: The first day you can link your Kroger plus Card to your organization is August 1, 2016. All supporters must have a registered Kroger Plus card account online to be able to link their card to an organization. If you do not have a Kroger plus Card, they are available at the customer service desk at any Kroger. Register online at www.KrogerCommunityRewards.com. If you are a new online customer, click on SIGN UP TODAY in the ‘New Customer?’ box to register. oTo sign up you will need to enter your zip code, click on favorite store, enter your email address, create a password, and agree to the terms and conditions. o Once you are done entering your information you will get a message asking you to check your e-mail inbox and click on the link within the body of the e-mail that was sent. Already have an account? • Click on My Account and use your email address and password to proceed to the next step. Once you are logged in, click on Edit Kroger Community Rewards information and input your Kroger Plus card number. • Update or confirm your information. Enter your NPO’s number 80369 or Friends of the Atascocita Library and click on confirm. • To verify that you enrolled correctly, you will see your organizations name on the right side of your information page. Remember, a customer must swipe their registered Kroger plus Card or use their Alt ID when shopping for each purchase to count. If you have problems signing in or creating an account please call Online Account Customer Service: 1-866-221-4141. Comments Off on Kroger Community Rewards: Time to Re-Enroll!